We don't think so. You know how to be bad all on your own. In fact, we think there is a new devil in town. And we think we know just who it is. We have heard tales of someone who has been making deals, and buying souls. We also hear that she is awfully fun to hang out with. We also heard that you like the color red. A lot. You wear it whenever you can. Your purse is red. Your car is red. Heck, you even painted your front door red. (Although, we think red is the best color for a front door. Just saying.) We aren't saying that you are THE devil. But you might just be A devil. And if so then we have just the thing for you to show off your demonic nature. 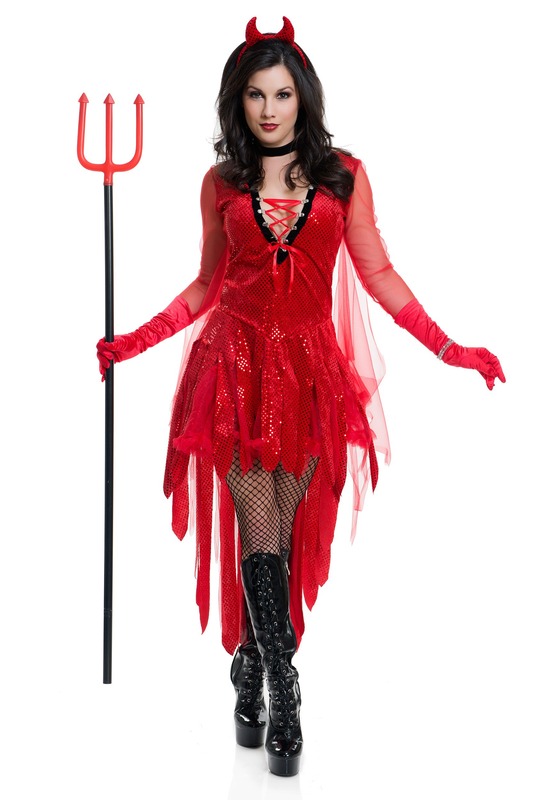 This Women's Sizzling Devil Costume will set you apart from all the other ladies you know. People will see you walking down the street, and know you are not to be messed with. Maybe the horns will clue them in to your fierceness. Sure some folks might think they can out smart you in a deal. But what they don't know is your deals are looked over buy a group of lawyers who live in the deepest pits of...well you know where. They make sure every deal is iron clad. You do have a reputation to uphold after all. So no, we don't think the Devil made you do it. We think you are devilish enough on your own.